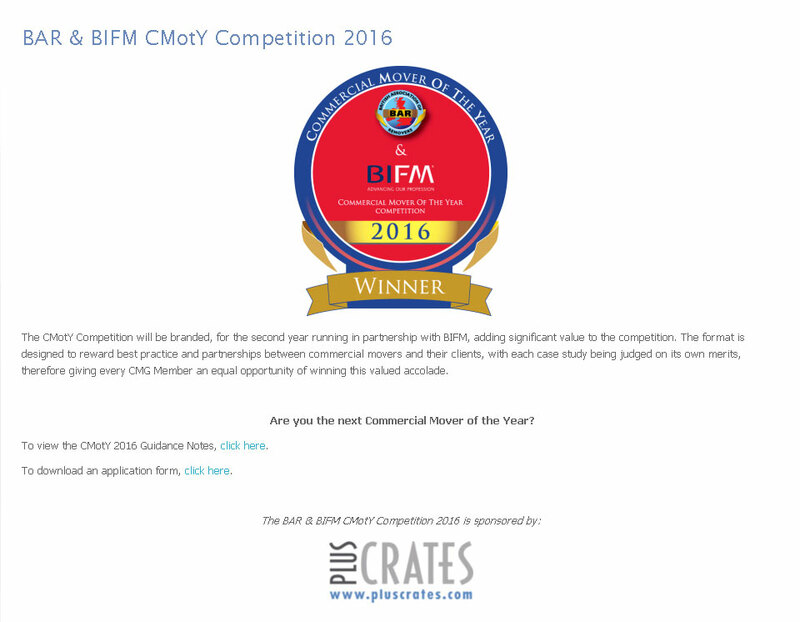 It’s that time of year again and Pluscrates are proud to be sponsoring the Commercial mover of the year competition for a 4th year in a row. The commercial moving industry is full of very hard working people and companies and it’s good to have some recognition for your hard work throughout the year and a time to celebrate the successes of the industry as a whole – and at Pluscrates are very happy to support the BAR & BIFM in providing this. Make sure you have entered by 5pm on Friday 29th January to be in with a chance to win this coveted award and join previous winners; Specialised Movers, Harrow Green, JT&Sons and Universal in their ongoing success. Application forms can be downloaded at www.bar.co.uk/cmoty2016 and the winner will be announced at the BAR Annual conference to be held at the London Marriott Hotel on Saturday 21st May at the Gala Night Dinner. The CMotY award has been awarded to members of the Commercial moving industry with exceptional levels of service for over eleven years. CMotY is a prestigious and coveted award which provides the winner with certificates, promotional stickers for their vehicles, national recognition for the winner as well as some promotion in local press and trade magazines. This year BIFM will also be offering a ‘Best Practice case study’ for the winner and Basil Fry will be offering £1,000 worth of insurance. It really is a prize designed to help your business grow. Those of you who have read Decembers Removals and Storage magazine will no doubt have seen the article about Universal Commercial Relocation (last years winners) in which Managing Director, Sarah Cole says “It has provided us with a good excuse to go out to a wider market and let them know about us. The win is a focal point for our marketing drive.” a clear example of how winning this award can help move your business forward.